Fun, playful, affectionate, sweet, mischievous and confident. Those attributes could only describe a one year old Boxer. Juliette has had a rough start in life, battling Mange and Kennel Cough but she's getting better in a hurry. Her fur is starting to fill in nicely and with that wrinkly little face, she's a real looker! This pup needs a home with an energetic family. Even with her health issues, she's always game for a spirited wrestling match, or a round of fetch. How about tug-o-war? Yep, that's another one of her favorites. 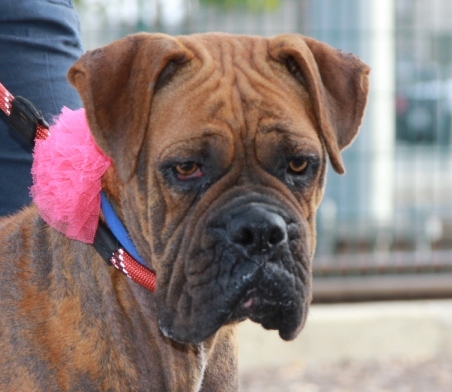 Juliette is a 50 lb girl who walks very nicely on leash. She loves playing with other dogs and aside from occasionally confusing my shoes with one of her toys, she's a well behaved pup. She seems to be house trained and is ready to go into her forever home. If you think that you have what it takes to keep up with this young girl-about-town, Miss Juliette will be extremely appreciative.